Quick question: what do the following bands have in common: The Gathering, After Forever, Epica, Ambeon, Within Temptation, Autumn, Orphanage? Well, they’re ALL Dutch female fronted metal (various genres) bands! While I consider myself fortunate discovering all those beautiful voices and bands, I have been waiting for a couple of years for a male fronted Dutch band able to match the standards set by the aforementioned bands. 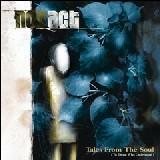 Well, my wish was granted when, at the beginning of the year, the newcomers NovAct released their debut album ‘Tales From The Soul (To Those Who Understand)’. It’s hard to predict what is yet to come this year (especially on the newcomers section), but until now, this IS by far the best newcomer of 2005 and it’ll definitely be in Top 10 of the albums of the year. Let me put your mind at ease from the get-go: although the band plays progressive metal, they’re not the one thousandth Dream Theater clone, actually they’re nobody’s clone. And here lies their main advantage: the sound they created is very original, powerful, rich, full of emotion and warmth. It’s difficult to compare it with some previous works, I’d say that in spirit it has something of Queensrÿche’s Rage For Order and in character it resembles a debut album from back in 1994 by Wicked Maraya – Cycles. The Arnhem based quintet managed to bring a breath of fresh air with their highly original album, benefiting from the excellent production of Everon’s Oliver Phillips and Christian Moos. Definitely, the first thing you notice when listening to the album is the uncanny voice of Eddy Borremans. Warm, with deep tones and a slightly nasal tone (Vanden Plas’ voice Andy Kuntz comes to mind but only with more depth), he manages to catch you with his emotional style. Another great advantage is the fact that Eddy Borremans is singing his own lyrics and that he’s got some strong opinions on social and political issues – child abuse, fake wars, political false pledges, which adds to the depth of the album. Wouter Wamelink’s flowing guitar with his catchy and inspired solos and Michiel Reessink’s great keyboards hooks and atmospheric style combine to give the album an unique progressive sound. The opener, Sharply Condemned is a fast paced with a good build up, heavy and melodic riffs with a strong comment on our inability on acting upon acts of violence that we witness. Hope And Fear is an excellent keyboard driven song, with a catchy hook and flawless rhythm changes. One of the highlights of the album, Eternal Life is a tribute to the late Jeff Buckley, quiet and peaceful at times with a great crunchy solo from Wouter Wamelink. Path Of Daggers has an excellent rhythm with a good bass sound (Jeroen van Maanen) and bass drum (Martijn Peters great throughout the entire album). Excellent keyboards on the chorus. So Help Me God has the keys creating the melancholic base for Eddy’s voice which sounds at times warm and emotional and at times sharp and angry. Flower deals with cases of child abuse and has stand out performances from both the keyboards and the guitars. The Rider starts with a heavy rhythm, good double bass drums and gloomy keys with an emotional guitar solo. Nothing Worth Fighting For is a typical progressive metal song with good contrast between the guitar rhythm and the keyboard atmospheric sound. Strong lyrics dealing with the useless wars fought in various parts of the globe. Promises blames the lies that politicians keep throwing at us; inspired vocal lines are backed by mellow keys and a good up-tempo guitar driven rhythm. The last song of the album, Bad Religion sums up the band’s best quality: the talent to mix the quiet keyboard lines with the power and heaviness of the guitars, opening up the sound for the deep and full of emotions vocal chorus. I agree, this is not a progressive metal album with a 4 octave range singer, it doesn’t have 10 minutes plus complex instrumental parts, boombastic or epic elements that would appeal to a multitude of fans. Instead, the band has chosen a different approach, choosing to make you think and pay attention to the multiple facets of the music. After each listen you are left with a sensation that makes you want to start all over again. Every time you discover something new crafted within each song. This album has all the right ingredients of a great progressive metal album in every sense and I think that the band has a good chance to become in the next few years one of the leading European progressive bands. Bottom line: try NovAct, there’s no chance you’ll be disappointed!